Public Safety Department and Citizens District Councils Hold Four Picnics! It's August and most of the big Bay City festivals have already come around. The next one will be the annual River of Time in September, but this month there were FOUR National Night Out Against Crime picnics around Bay City. The Bay City Department of Public Safety and the Citizens District Councils team up each year to put on these fun events. The idea is to get people out of their houses and into a local park for games, prizes, food, exhibits and generally just a good time. Events were held in Carroll Park, Bay County Child & Senior Center, Chuckies Bay County Market, and in Defoe Park. MyBayCity.com's photographer was at the Defoe Park event. That's where the fire departments had the chili cook-off, so maybe that's why he went there. The Defoe picnic was jointly sponsored by ServPro. There were green trucks and vans all over the park and plenty of volunteers to man the games and events. The Midland Salzburg Citizens District Council was cooking up hotdogs. Copoco Credit Union had free popcorn. The library was there as well as many other organizations. Kids may have had the most fun. 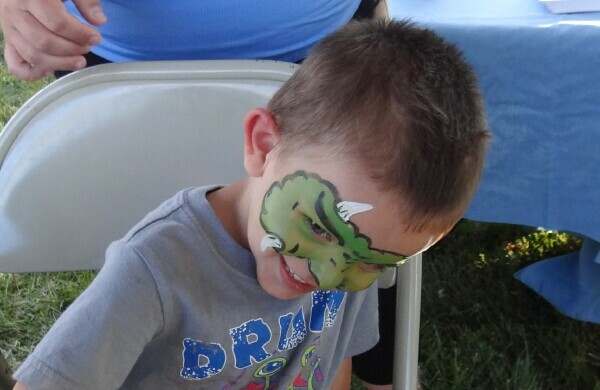 There were games of various types, a bounce house, police cars and fire engines, and face painting. Miss Bay County was on hand and seemed to attract lots of little girls who wanted to be seen with a princess. For those a little more aggressive, they could sit in a police van and sound the powerful horn. A little father over the firemen had a hose run from a fire hydrant and kids could try to knock down the flames in a plywood house. Another treat for the kids was free face painting provided by members of the Face the FX makeup club, which does all of the makeup for the annual Haunted Masonic Temple presented each fall by the Bay Arts Council. The line was long but with four artists it moved quickly. Besides, the FX crew kept at it until the last face was painted and the park was empty. Reports were that each of the events was a great success. If you missed it this year, don't worry, the party will be back next year. Richard Hembling, Trude Tewksbury, Melinda and Larry Elliot get set to cook and serve hotdogs. Each of the chili entrants had a different recipe. By the end of the event there was hardly any left. Bangor prepares their sample for the judges. And the end result is as well presented as it was tasty. and Chuck Sheaffer from ServPro of Bay City judge the chili. Under the pavalion the Midland Salzburg CDC members cooked 300 hotdogs, which were quickly consumed! CDC mebers Melinda and Larry Elliot handle the cooking. The bounce house was in constant use. Richard Hembling was having a grand old time serving up large pickle slices. Just a fraction of the people at the picnic tables. Face the FX makeup artists painted faces for almost three hours. Nothing attracts kids like a puppy! Hampton Township fireman Wil Frye helps a youngster handle that hose. She knocked down all of the flames in the plywood house. Will Frye helped another youngster. And good thing ... If he had not been holding on, she could probably have ridden that hose like a pony! Youngsters get an introduction to the equipment in a police SUV. Under the chili cook-off tent people tried it all. The chili was free. Donations were gladly accepted and all proceeds went to the Bay County Firefighters Association and Camp Fish Tales. Officers Lanava, Turner, and Darrow get a picture of the picture taker. Betsy Bourassa from Emmanuel Lutheran Church cheers on a young fisherman.